An Expandable VHD will load much faster into RAMDISK, since only the space occupied by files of 600 MB needs to be loaded. It Expands then to the maximum VHD Size of 3.9 GB and giving the RAMDISK of that size a lot of FREE Space. When booting such Expandable VHD as FILEDISK then the FREE Space is useful and needed for Install of drivers for New Hardware. 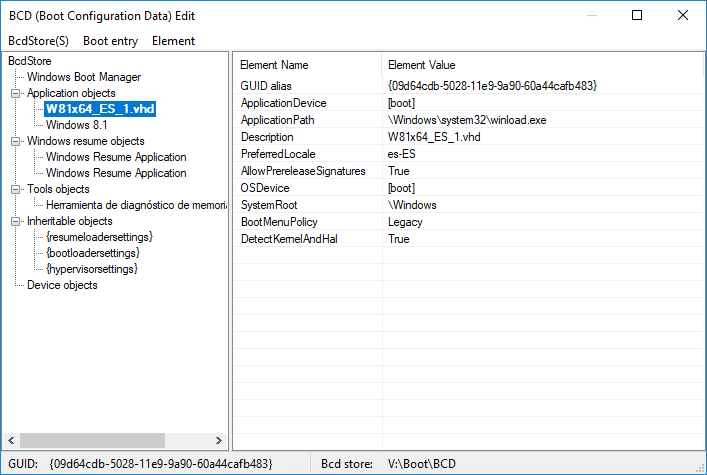 When booting the VHD + WIM set from Portable SSD connected via USB to various hardware, then we collect a lot of driver info in the System Registry. After the eXPerience of various machines, then it is useful and needed to CAPTURE new WIM File that will contain the additional driver and program files. APPLY of that New WIM File to the selected VHD File will result in the original available FREE Space in the VHD. It is good to use initially a VHD Size of 25 GB booting as FILEDISK and use the FREE Space to collect drivers and install new extra programs and Windows Update. e.g. 3.9 GB for a 8 GB RAM machine and 1.5 GB for a 4 GB RAM machine. Such small Expandable VHD is then Universal and can be used to boot on any machine fast into RAMDISK. LZX Compression can be used in CAPTURE to make WIM files of smaller size. Roughly with LZX the time to CAPTURE is doubled and the WIM Size is 30% smaller so that it saves for a 9 GB WIM file about 3 GB. I'm sorry to tell you on external BCD Optin is not selected, also same on internal BCD, additionally HD and Partition to boot from are not selected on internal BCD, attached pictures. The Disk setting on Internal BCD corresponds to device boot and is according to solution given by karyonix which is booting OK.
Do you need the Optin Setting ? I can add that easily in the program. And what occurs when you try to boot ? I expect it is all working OK. I just got hold of the latest vhd_wimboot. I have been running the wim+vhd combo for quite a few weeks now, always baking wim's and vhd's with gimagex and winntsetup respectively. I would like to know the main practical differences between vhd_wimboot and winntsetup, as well as whether the former covers the function of gimagex as well in capturing the state of a windows install (which I call wim-baking). GImageX is working with Microsoft WIMGAPI whereas VHD_WIMBOOT is using wimlib for Capture taking modified WimBootCompress.ini into account. WinNTSetup does not have Capture functionality and in Apply then the Grub4dos entries are not made and the Boot Manager menu entry needs additional corrections. 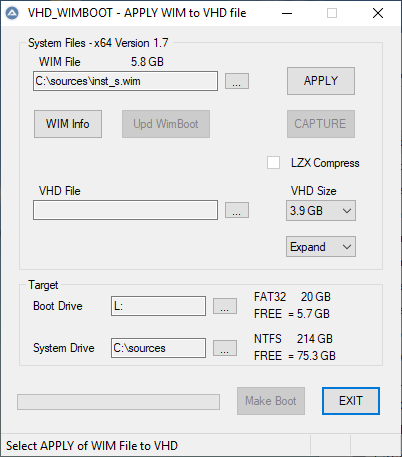 VHD_WIMBOOT is an all in one solution and has also the Update WimBoot button useful to Update VHD+WIM combination when relocating to other drive. So, let us say I have normally booted my usual vhd+wim combo and am now surfing the web, happen to find some software I wanna try out. I'll download and install it. At that point the install data reside on the vhd, not on the wim, right? If so, I now would like either to bake a new wim+vhd combo incorporating the recent change or append the recent change to the already existing wim. Which is the better thing to do? And how shall I practically proceed via vhd_wimboot? If desired You can Apply the new WIM File to the same VHD where the program will offer to Format the VHD first. In this way you re-gain the free space in the VHD and make a better WIM File containing your software. Are there any parameters in the procedures that I should apply to the end that u have just mentioned? ok one more question, when u say "save that software also in the wim archive", do u mean "in a fresh wim archive" or in the same as the one I have already. I am asking u this question because I have to know whether to bake a new wim file or use the same for the update, which would entail my prior saving the existing wim before all the procedures lest something should go wrong; if it is a new wim file I have to bake, I will not go to the trouble of saving the one I already have. sorry wimb, no need to answer, I have just booted off a fresh vhd I made thru vhd_wimboot, which, in my view, makes u a genius of wim+vhd automation. everything went spick and span, no flaws, everything configured automatically. my congrats. One other question: does the system dir have to be ? :\wimboot perforce? can't it be, let us say, ? :\ (the root of the drive)? If it can't, no prob? U have just spared me the trouble of testsigning, configuring under conventional bootmgr, configuring under g4d, and what not. My congrats again, man! Thanks for testing and happy that you like the program. The folder for WIM files does not need to be Wimboot. Any Root root folder max 8 chars is allowed e.g. sources would be ok as well. btw, at the end of it all, I have 1 vhd that vhd_wimboot overwrote + 2 wims, one is the one I had before, the other in ? :\wimboot, named W10x64_US_1.wim. I thought the latter was the one involved in the new combo, so I tried to delete the one I already had (install.wim): --> the system prevented me from deleting it, which made me understand that this wim was the file involved in the new combo instead. at that point I moved W10x64_US_1.wim elsewhere just to see whether the system allowed me to do it, which it did. now its size is smaller than install.wim, which stayed about or exactly the same size, I honestly did not look before, so I do not know. what shall I do with W10x64_US_1.wim, as the system does not seem to care about it? 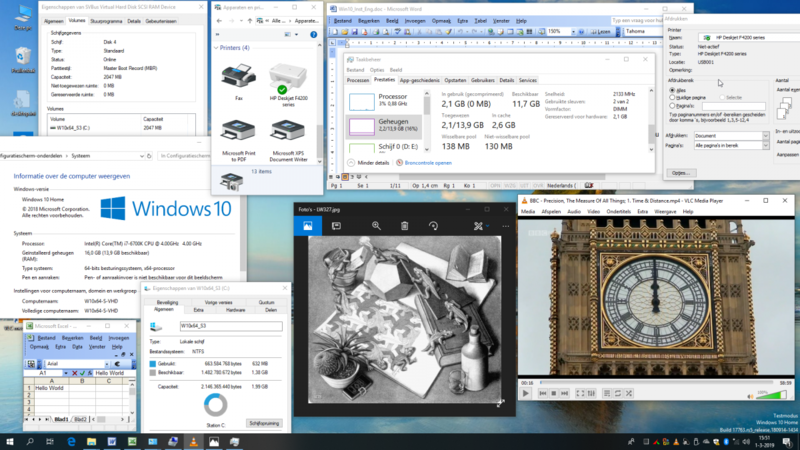 The file W10x64_US_1.wim must be the result of a Capture, since in that case such filenames are auto created in folder Wimboot (hardcoded) on selected System Drive. After Capture you can select that WIM file and use it for Apply to your VHD file, which can be selected existing VHD file or otherwise New VHD file is created. For Apply the WIM file must be in root folder max 8 chars of System drive. I think it is not logical to have hardcode folder name Wimboot for Capture, whereas for Apply it is any root folder of max 8 chars on System Drive. So I will change this in the program so that also for Capture the folder is determined by the System Drive folder selection. thanks again, where do I get it? btw, there is still that issue whereby, no matter how often I have updated wim and vhd, and filled the wimboot dir with successive wims, the original install.wim in the root dir (d:\ in my case) still remains the unmovable and undeletable one (permanently in use), whereas I might as well sweep out the whole winboot dir with the whole series of wims in it. I have had the feeling that apart from automating the boot process (which is an excellent thing), I ain't doing nothing to the wim, and I am probably doing something to the vhds, that again seem to be hopelessly attached to the original wim on the root dir (install.wim). nothing doing, wimb, it still imposes choosing or making a dir on the root, and I think I have always had only this version, which I got hold of early this afternoon. Didn't tested at the time, I changed BCD as the usual we were using since the begining, I didn't expect it to Ramboot the way it was, but now just ran a new test, this time with your new v1.7 and saw Optin is selected now on both BCDs, but internal BCD location of HD and Partition remain same way, this time I decided to test it this way as you said, then rebooted the PC and it Rambooted flawlessly. Congratulations, all is working very fine, I also tested capture on v1.6 and it was working very fine. Sure if you only select System Drive then it will make folder Wimboot on System Drive and use that folder. But you can click on any root folder max 8 chars on System Drive and then that folder is used. same thing, wimb: it seems to capture, apply and bcd configure fine, but the useful wim stays my original one on root, which it will not consider compatible and suggests new capture; these new captures can be applied to existing or new vhds, or wimboot can be updated, which is the only function that seems to work. 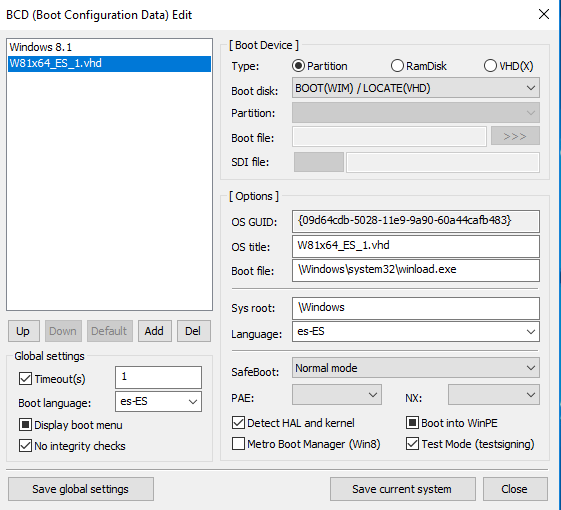 the resulting vhds will not boot as a result of registry incomplete transfer (bsod stuck at ...\system32\system), the only ones that boot are the original vhds linked to the original install1.wim file out of the wimboot dir (on the root dir). I left everything at default values, one of which was 3.9 as the size of the expand vhd, with the compressiong box unticked. the result was about 800mb used space and 4gb total space. the loading in ram was fast and smooth, mostly limited to the used space, as the counter visibly skipped the freespace, but the ram it occupies according to resmon.exe is a 4gb greyspace. Shall I stay like this, or try and shrink the vhd by 50%, which was the usual size of my old ones? viz, if the 4gb of occupied ramspace are there to no avail, I would sooner shrink the file, otherwise I would leave it as it is. You have a lot of RAM in your machine, so the 3.9 GB is no problem at all. The FREE Space can be quite useful when booting on other machines to allow install of drivers for that hardware. It is all a matter of personal preference and dependant on what hardware you have and where and how you want to use it. If you would have a machine with only 4 GB RAM then it is needed to reduce the VHD Size to 1.5 GB suitable for RAMDISK booting.